PORT-LOUIS, Mauritius, Apr 26 2016 (IPS) - Fifty year-old Prem Kanoosingh rages against his peers who excessively apply chemicals, mostly pesticides and fertilisers, to their crops. “They make cocktails from several products and they use them on their crops. They are criminals”, he shouted at a function where the Food and Agricultural Research and Extension Institute launched a bio-farming project in early March 2016. 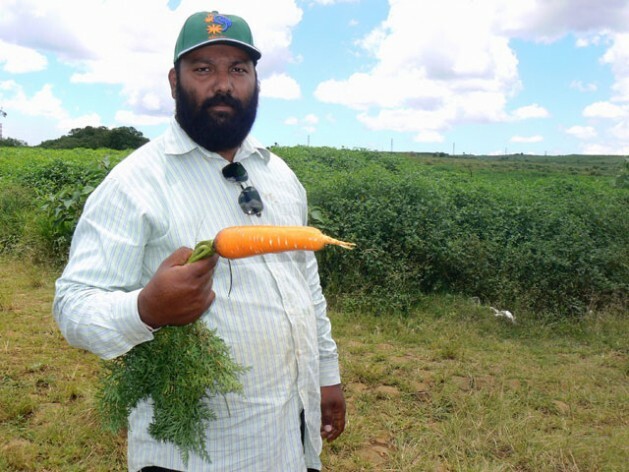 This farmer, residing at Union Park, southern Mauritius, has been practicising bio-farming since the past decade on one hectare of land: rotating his crops, using manure and biological products to fertilise his land. “It will take 300 years from now to change the mentality of our farmers”, he felt. Official statistics indicate that Mauritius imported 54,000 tons of chemical fertilisers and 2,250 tons of pesticides in 2015. Out of the 307 samples collected from the farmgate level for testing purposes, 72 per cent had no pesticide residues, on 24 per cent the presence of pesticide residues was below the codex maximum residue level (MRL) and 4 per cent exceeded this level. Earlier this year, the chamber of agriculture carried out a survey and found that farmers use at least sixty active substances in the fields. Firstly, though several of these substances are banned or are not authorised by the Dangerous Chemical Control Board, they are still in use today in the island. Secondly, while pesticides are used to deal with a confirmed problem, 90 per cent of treatments are used as preventive measures, without any confirmation of any specific problem. Thirdly, the same products are used to treat all kinds of problems that visually appear similar as well as on several crops. Lastly, there is an erroneous perception regarding the role of fungicides that farmers use often as “vitamins for the plants”. The chamber’s general secretary, Jacqueline Sauzier, believes that time has come to think about healthy and ecological ways of producing vegetables. “One of them is smart agriculture where the use of chemicals is strictly limited to the bare essentials with the help of alternative methods of production such as trapping and culture rotation. This brings down production costs and the farmers are less exposed to chemicals and the consumers get healthy products”, she informed IPS. Under this project, targeted actions are organised to reach three levels of disruption. At the first level, there is a reduction of 25 per cent through optimising use of phytosanitary products through better understanding, dosage, application and results. In the second level, producers reduce chemicals by 50 per cent by using alternative biological products and introducing good insects to fight the diseases that affect the plants. And at level three, they reduce the use of chemicals by 75 per cent taking a fresh look at the production system based on the principles of agro-ecology, as for example, the diversification of plant varieties under cultivation, culture rotations, mixed farming and the introduction of resistant plant varieties. Mrs Sauzier does not blame the farmers for the excessive use of chemicals because the present agricultural environment does not give them alternatives. “They lack labour and training. They seek help or advice from their peers and from chemical vendors. More often, this advice goes towards the use of chemicals and not towards understanding the reason behind the appearance of the disease that affect the plants. The farmer is at a complete loss, he uses the products as he has been told, without ever understanding the reasons behind”, she explains. Eric Mangar, an agronomist from the Mouvement Autosuffisance Alimentaire who teaches bio-farming in schools, recalls how scientists have encouraged farmers to use chemicals intensively in their crops for better yields.“We have boosted our production with chemicals but this has not solved the issue of hunger in the world. Instead, we have destroyed our soil with chemicals. Now it’s up to us to make it fertile again, be it with smart agriculture or natural farming. There is still much fauna and flora in the soil. It is a living matter and it can still produce good quality vegetables”, he says. Manoj Vaghjee from FORENA (Fondation Resource et Nature), an NGO, finds smart agriculture to be a very good initiative to stop farmers taking too many more preventive measures than necessary. “If we can reduce the volume of chemicals used, it’ll not be bad”, he says. But he is worried about of certification. “How can we know if the farmer is really reducing the use of chemicals on his crops? Who decides at what stage the farmer becomes smart? Clear information should be given about smart vegetables to the consumers”, he insists. Vaghjee believes giving the consumers the choice to chose from several types of production is the best way forward.“Why should we be confined to one type of agriculture? Why not let producers use any model, conventional, smart, bio, natural and zero-budget and all and give the choice to the consumers to drive the market?,” he asks. Farmers in Mauritius believe the wrong information is being circulated about the community to justify the rising rate of cancer in the island. “Definitely, we lack training about how to use chemicals efficiently and safely but, rest assured, we are not killing people”, Kreepalou Sunghoon, secretary of the small planters association told IPS.